Caroline Taylor started the discussion off declaring, “I just want to say that I feel humbled joining the panelists gathered here today to talk about our local, sustainable food system.” The Executive Director of the Montgomery Countryside Alliance was indeed in good company joined by activists, farmers, chefs, nutritionists and food lovers. 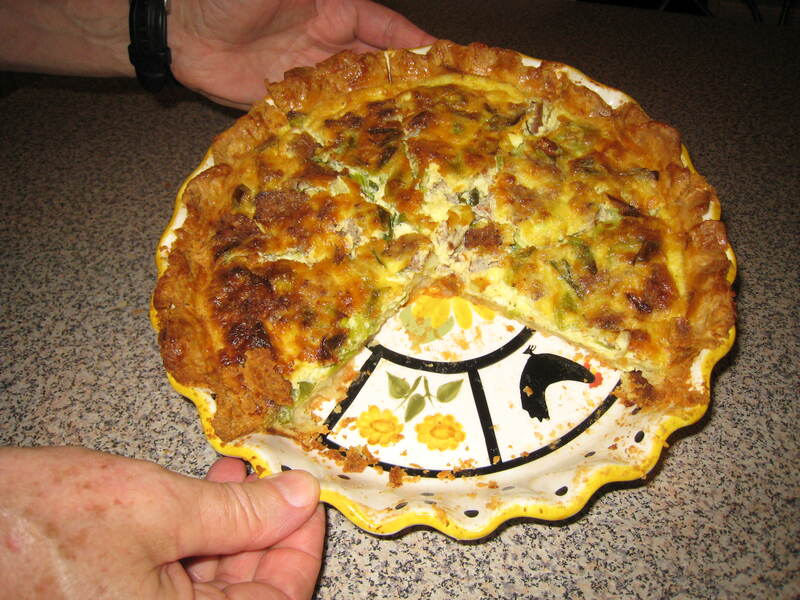 Cheryl Kollin (Full Plate Ventures), Bill Franz, and Glenda Grogan serving quiche. Forty people gathered around the table at Bethesda Green on the morning of Sunday, August 21, to enjoy a locally sourced, homemade breakfast. The discussion, Closing the Loop in our Food System, introduced various perspectives of our local food system. Today’s gathering was the first of three educational and delicious food events in the series, On the Farm; Around the Table – Connecting farmers, food, and community in three meals. The series, hosted by Bethesda Green and Full Plate Ventures explores the complex issues around building our local, sustainable food system and introduces attendees to those who are the passionate architects of this newly emerging system. Caroline encouraged the audience to let our County Council know how you feel about protecting Montgomery County’s 93,000 acre Agricultural Reserve and to encourage the Council to approve policies that protect and expand local farming. Caroline was joined on the panel by Shannon Varley, a farmer and owner of Bella Terra Family Farm, who shared the challenges of converting conventional land into organic farming. “My husband and I are painstakingly reclaiming a few acres at a time and have 10 acres in cultivation in which we raise high-quality, grass-fed meat, pastured eggs, vegetables, flowers and herbs.” She’s fortunate to have secured a long-term lease to farm on. She and Montgomery Countryside Alliance created Land-link, a program to match new farmers with available, affordable land. 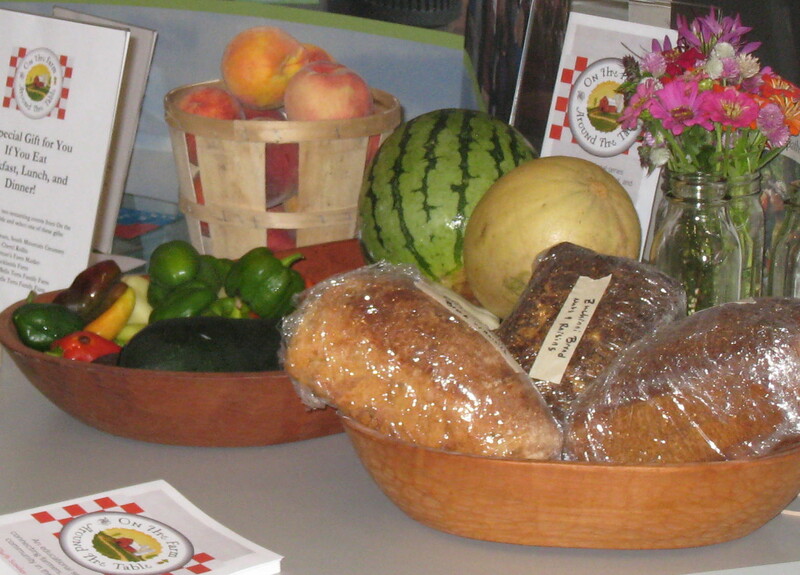 Many local farmers sell their wares directly through local farmer’s markets and Community Supported Agriculture (CSA). Diane Welland, a registered dietitian and author on the panel discussed how buyers have to shop differently when eating seasonally. “Instead of planning your menu and shopping the aisles of the grocery, you need to see what’s ripe that week at the farmer’s market and then plan your meals,” explained Diane. Restaurant owners face challenges of finding local sources of food for their menus. Tony Alexis, owner of Yamas Mediterranean Grill, offers a moderately priced menu that includes organic ingredients. “I believe that the sustainable food movement starts with land stewardship, healthy eating choices, and even how my employees are fairly treated,” he shared with the audience. He’d like to source locally, but hasn’t yet found a steady supply—one of the challenges the series highlights and collaborators hope to address, recognizing the need to build an aggregation and distribution system for local foods beyond farmers markets and CSAs. This series begins to informally build relationships between producers and buyers. “I made some great connections this morning and hopefully will be working as a volunteer one day at Bella Terra Farm,” offered attendee Misha Clive of the Green Business Network. Today’s gathering also proved successful in connecting businesses to one another. “It was a wonderful day to connect,” exclaimed panelist Jessica Weiss, Executive Director of growingSOUL. “It is quite possible that Shannon Varley found a way to feed her animals inexpensively and rejuvenate her soil, while I found a new home to begin municipal composting. It was a very powerful gathering and I look forward to continuing to connect the dots with all of you,” she shared with me after the event. Attendees’ interests in this discussion ranged from personally wanting to eat a healthier, locally sourced diet, to professionally engaging in local policy issues around land use and available farm land in Montgomery County. The audience included writers, film makers, and educators all interested in promoting better eating through the growing and production of sustainable foods. The morning was capped off with a tour of the Bethesda Central Farm Market, introduced by founder Mitch Berliner who described the vibrant mix of producers, artisans and musicians he assembles weekly. Greg Glen from Rocklands Farm. The series continues Saturday, September 10 with Fertile Ground – A local, sustainable farm tour and lunch. Join us for this family friendly tour of Rocklands Farm, in Poolesville, Maryland, just 35 minutes north of Bethesda. Free bus transportation leaves from Bethesda Green at 11:45 am and returns at 3:30 pm. Lunch will feature Rocklands’ own grass-fed beef burgers with a variety of vegetarian sides and fruit cobbler. The series concludes on September 19 with dinner at Chef Tony’s Restaurant that will feature a menu around seafood, artisan cheeses, local wine and whatever is fresh from the farm that day. For details and registration visit, On the Farm, Around the Table. Bethesda Green and Full Plate Ventures gratefully acknowledge our supporters, including MOM’s Organic Market, Chef Tony’s Restaurant, Norman’s Farm Market, Johns Hopkins Center for a Livable Future, and all of our contributing partners. They start at $264,000 for a townhouse; even the freestanding homes are in the mid-$300s. And each home produces as much energy as it consumes. Nexus Energy Homes, a Stevensville, Maryland construction company, is building a community of 55 affordable, net-zero homes in downtown Frederick. Each home generates both geothermal and solar energy and is equipped with Energy Star appliances, LED and CFL lights and other energy saving and energy monitoring features. More information from the Washington Post, Mother Nature Network and Nexus Energy Homes. The Herald-Mail reports the Hagerstown Solar Farm that received approval in July from the Maryland Board of Public Works is still not a done deal. The solar installation would generate about 20 megawatts, doubling the state’s solar power output. A hearing Thursday at the Maryland Public Service Commission headquarters in Baltimore went smoothly, with no opposition presented. The plan now faces a public hearing at Hagerstown Community College on Wednesday (8/24) and several more state and local government approvals before Maryland Solar LLC can make the plan a reality. The American Bureau of Shipping (ABS) announced it has issued its first Approval in Principle for a new ocean-based renewable energy design. Developed by OTEC International LLC of Baltimore, the approach converts liquid ammonia into gas in a heat exchanger using warm ocean surface water. The ammonia gas then drives turbines that turn generators to produce electricity which is then exported through a submarine power cable to a land-based utility company. The ammonia is condensed back into a liquid phase using cold ocean water pumped from 3,000 feet below the water’s surface and the process begins again. Sungevity last week announced a renewable energy tax equity fund with Citigroup Inc. that will support over $50 million of new residential solar lease projects. Sungetivity has become one of the fastest growing solar companies in the country thanks to its innovative lease program that allows homeowners to install solar panels with no up front cost. The funding was arranged through Citigroup’s Alternative Energy Finance Group. Sungetivity says it plans to hire 200 new employees by the end of 2011, doubling its current workforce. CNN reports the U.S. military is becoming “a leading buyer of cutting-edge renewable energy technology.” The network reports a number of reasons why this is happening. One is cost. The combined U.S. forces consume 80% of the energy used by the federal government and spends $15 billion a year on fuel. The military has also had to overcome serious logistical difficulties getting diesel fuel to its forces in remote areas of Iraq and Afghanistan. The cost of doing so has been heavy. One out of eight U.S. Army casualties in Iraq was sustained by soldiers protecting fuel convoys. CNN describes, in this online article, the steps being taken by the Army, Navy, Air Force and Marines to reduce costs and casualties through renewable energy technology. Maryland Clean Energy Summit 2011, Thursday, August 25 – Saturday, August 27, Marriott North Bethesda Hotel and Conference Center. More than 60 speakers from business, government and energy non-profits will discuss how Maryland is “Investing in Energy to Generate Jobs.” Clean energy companies and those that serve them will exhibit. This is an excellent education and networking opportunity for those who are in the clean energy field or curious about it. BG 101, Thursday, August 25, 4 – 5:30 pm. Bethesda Green’s monthly orientation session. Learn about Bethesda Green history, programs, upcoming events and volunteer opportunities. Fertile Ground: Local Sustainable Farm Tour and Lunch, Saturday, September 10, 12:30 – 3:00 pm. Rocklands Farm, 14525 Montevideo Rd., Poolesville, MD 20837. Free shuttle transportation available from Bethesda Green. This is the second in the series On the Farm; Around the Table, connecting farmers, food and community in three meals. More information here. 2011 Bethesda Green Gala, Wednesday, October 5, 6 – 10 pm, Round House Theatre. The gala recognizes Bethesda Magazine‘s Green Award winners for their inspiring work in the environmental community. Mark your calendar now. More information to come. More than 300 people gathered at Imagination Stage October 7, 2010, for our inaugural Gala to recognize the region’s green champions. It was an evening of inspiration, of sharing and connecting as a community, and a celebration of our collective progress as businesses, residents and government who see green as a way forward. Click here to see video highlights of the event. Stay tuned for details about the 2011 Bethesda Green Gala, Wednesday, Oct. 5 at the Round House Theatre. MoCo Residential Energy Efficiency Rebate Program – Bethesda Green has learned that Montgomery County, as part of its American Recovery Act block grant, will soon be making funds available to assist homeowners who make energy improvements to single family homes and condominium units. The program will provide between $1,000 and $3,000 in cash incentives for home owners who make new improvements such as air sealing, insulation, HVAC, and appliances. For example, consumers can apply for $1,000 for the purchase of an ENERGY STAR qualified air conditioner, or $2,000 for a qualified air conditioner and furnace. Approximately $1.1 million is available and the County expects to serve 300 to 500 participants between the program launch date (on or around August 25, 2011) and July 30, 2012. Incentives will be available on a first come, first served basis. To be eligible, consumers must have obtained an energy audit from an auditor participating in the Maryland Home Performance with ENERGY STAR Program or the Pepco, BGE or Potomac Edison (Allegheny) utility sponsored programs. The applicant will also need to have a scope of work (or works) from the contractors whom they intend to use for their projects. Keep an eye on www.BethesdaGreen.org and/or the MoCo Department of Environmental Protection for more information soon. Country Thyme Farm Market “Circulating” Petition to Governor – If you shopped at Country Thyme Farm Market throughout the last decade, you know the farm stand on River Road adjacent to the Kenwood Country Club was shut down in 2009 by the state highway administration. Local media, including the Gazette, ABC7, and WAMU have covered the story of Boyds farmer and Country Thyme owner Jonathan Sadd and his attempts to reopen his River Road business. Sadd now hopes former customers and area supporters will sign a petition to Governor O’Malley, which he also intends to send to Maryland Secretary of Transportation Beverly Swaim-Staley, Acting Administrator MDSHA Darrell Mobley, and First Lady Michelle Obama. MOM’s Organic Market College Park Renovation Almost Complete – The World Interior Design Network reports that MOM’s renovation and expansion is expected to be completed by August 19. The company has installed energy-efficient LED track lighting throughout the entire store, which was repainted with low VOC paint. Refrigerators and freezers are all closed door models and are equipped with LED lights. The ceiling includes skylights and 100% of the store’s electricity is supplied by wind power. After driving up to (or past) the electric car charging station, customers will find wider aisles inside and 40% more shelf space than before. Perdue Goes Solar – Renewable Energy World calls it, “one of the largest commercially-owned solar power systems in the eastern United States.” The poultry company has installed 6,720 solar panels at its facility in Bridgewater, Delaware. The number of solar panels on Perdue property will total 11,000 when a second installation is completed this October at the Perdue corporate offices in Salisbury, Maryland. The panels, installed by Standard Solar of Rockville, are owned by Washington Gas Energy Services (WGES). Perdue will purchase the electricity generated by the solar panels at prices guaranteed by WGES. At peak production, the two installations will produce as much as 90% of the electricity needed to run the Perdue facilities. UM Study Makes Strong Case for Organic Poultry Farming – A team of researchers led by Assistant Professor Amy R. Sapkota of the Maryland Institute for Applied Environmental Health studied the comparative level of resistance to antibiotics in bacteria found on conventional poultry farms and on farms that were newly converted to organic methods. The results were much more dramatic than expected. “We initially thought we would see some differences in on-farm levels of antibiotic-resistant enterococci when poultry farms transitioned to organic practices,” Sapkota explained. “But we were surprised to see that the differences were so significant across several different classes of antibiotics even in the very first flock of birds that was produced after the transition to organic standards.” The results are detailed in this article from the University of Maryland. US DOE To Fund University-Based Green Business Competitions – The Department of Energy on July 21 announced it will fund a National University Clean Energy Business Challenge. The purpose is to “inspire, mentor, and train students from across the country to develop successful business plans for a new generation of U.S. clean energy companies.” The DOE Office of Energy Efficiency and Renewable Energy plans to make $2 million available to fund as many as six regional and one national competition in 2012. The DOE is currently accepting grant applications from universities interested in hosting one of the competitions. The winning competition sites will be announced this September and the business plan competitions will be held in late spring and summer 2012. 2nd Annual “Bake Bethesda A Pie” Contest – Do you like to bake? Does the idea of home made pie sound good to you? 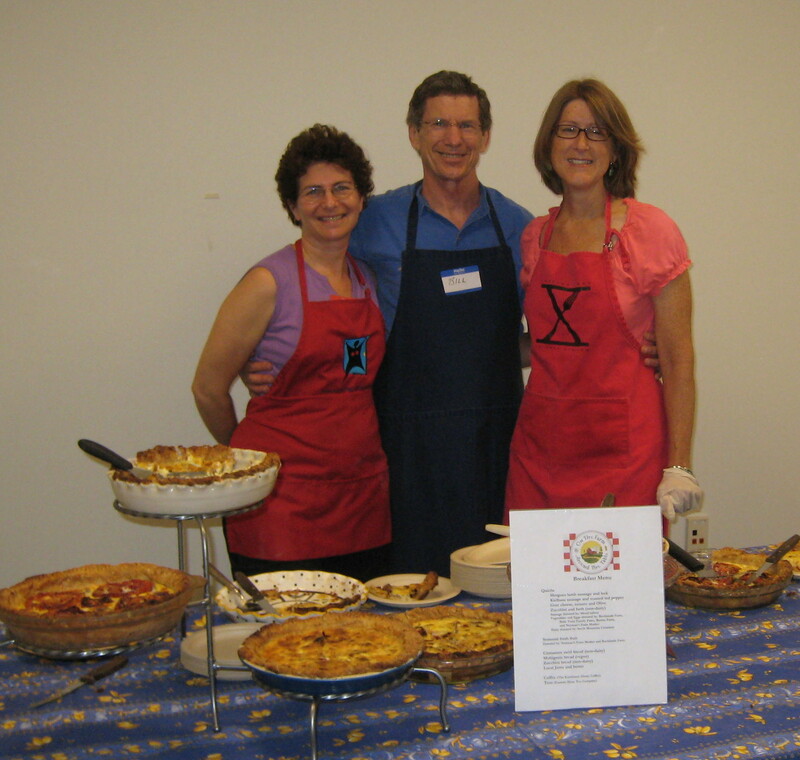 Sunday, September 4, the Bethesda Central Farm Market hosts its 2nd Annual “Bake Bethesda A Pie” Contest. This year’s contest will include an under 18 division and an adult division. Prizes will include gift certificates to local restaurants, shops and Bethesda Central Farm Market. Contest proceeds will benefit the Manna Food Bank. Information and registration are on the Internet. Informational Workshop for Auditors, Contractors and Program Partners about the MoCo Residential Energy Efficiency Rebate Program, Thursday, August 18, 9:00 am, UpCounty Regional Services Center, 12900 Middlebrook Road, Germantown, MD 20874. This workshop for contractors will provide information about the upcoming program (see article at top of this page) and example materials and communications kits to help contractors educate customers and participants about the program and inform them of other incentives that may be available. Additional workshops will be scheduled in August and September for consumers and program participants. Contractors register here. Bethesda Green Education, Outreach and Marketing (EOM) Group Meeting – Newcomers Welcome! Thursday, August 18, 4:00 – 5:30 pm. This team of volunteers meets once every month to discuss Bethesda Green’s marketing and communications needs. Closing the Loop in Our Food System: Breakfast, Panel Discussion & Farm Market Visit, Sunday, August 21, 9:00 am – 1:00 pm. This is the first in the series On the Farm; Around the Table, connecting farmers, food and community in three meals. Location: Bethesda Green & Bethesda Central Farm Market. Following breakfast and panel discussion, we will visit the Bethesda Central Farm Market on Elm St. between Wisconsin and Woodmont Avenues. Register here. Fertile Ground: Local Sustainable Farm Tour and Lunch, Saturday, September 10, 12:30 – 3:00 pm. 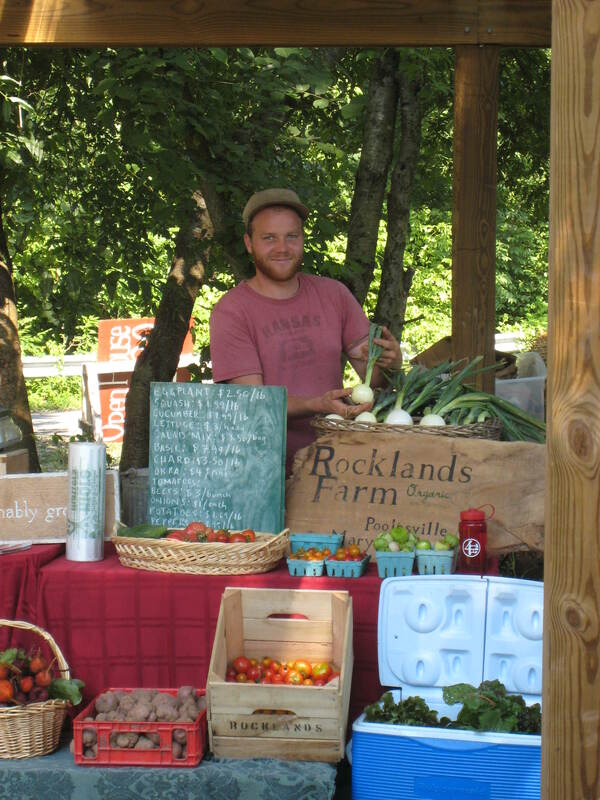 Rocklands Farm, 14525 Montevideo Rd., Poolesville, MD 20837. This is the second in the series On the Farm; Around the Table, connecting farmers, food and community in three meals. More information here. Despite prior predictions of rain, the sun was fully present Monday morning (August 8, 2011) along with politicians, business executives, reporters and area residents. They were gathered in a parking lot off Old Georgetown Road, just north of the Wildwood Shopping Center, for a ribbon-cutting ceremony and demonstration marking the debut of Maryland’s first solar energy-generating, electric vehicle (EV) charging station. 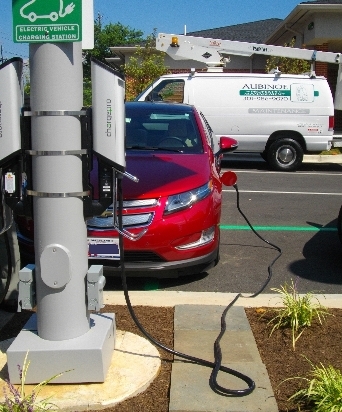 Made in Columbia, Maryland by Advanced Technology and Research Corp (ATR), the new charging station differs from EV chargers installed elsewhere around the state. The unit is the first to include a 1,410 watt array of 6 solar panels equipped with ATR’s GPS-based sun-tracking technology atop an 18-foot tall steel pole. Two Level II car chargers are mounted to the pole to service two vehicles at once. The solar generated electricity is fed through a micro-inverter that converts the DC electricity to AC, then into the utility grid, from which the chargers, in turn, draw their electricity. The sun-tracking technology allows the solar array to follow the sun throughout the day. ATR claims this will enable the solar panels to generate at least 30% more electricity than fixed panels would generate. The entire installation is very compact. The charging station demonstrated on Monday sits atop a narrow island in the parking lot. A shopping center or transit station parking lot could offer customers the use of these charging stations with a minimal space allocation. Alvin L. “Tripp”Aubinoe III, President of Aubinoe Property Management, and part owner of the property at 10401 Old Georgetown Road, purchased the charging station. Aubinoe stated he anticipates a growing number of EVs in the area and wants to provide a service for patrons of the surrounding businesses while they shop. “I hope that my actions here will inspire others to take their own steps towards a more sustainable future,” Aubinoe said. According to Cynthia K. Hoes, property manager for Alvin L. Aubinoe Inc., the two chargers are fully operational now. An EV driver (or two) can simply pull up, attach the charger cables to their cars and visit adjacent offices and stores while adding miles to their EV batteries. The service is free at this time. Aubinoe intends to charge a fee, which has yet to be determined, at some point in the future. The pole mounted, sun-tracking solar energy generator was produced with the assistance of a $1.1 million Clean Energy Economic Development Initiative (CEEDI) grant that the Maryland Energy Administration and the U.S. Department of Energy awarded ATR last July. 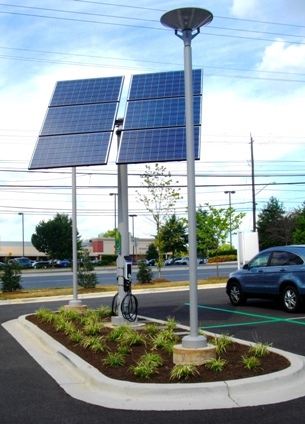 In addition to the EV charging station, the grant, which uses federal stimulus funds, helped enable ATR to develop sun-tracking solar power producing generators that mount on parking lot and highway light poles, a post mounted solar unit for residential use, and a system that attaches to a wind turbine to create a hybrid electrical generating unit. Speakers at the Monday morning ceremony, in addition to Tripp Aubinoe, included Maryland Governor Martin O’Malley, Montgomery County Executive Isiah Leggett, ATR Founder and CEO Dr. Jackson Yang, Baltimore-Washington Electric Vehicle Initiative Executive Director Jill Sorensen, Bethesda Green Executive Director Dave Feldman and other government and ATR officials. Dan Rudt is a former radio news anchor and public affairs program host for WPGC-AM, and producer for Westwood One Radio Networks. He is currently a freelance writer/reporter in Montgomery County, Maryland covering the “green” beat.